Several methods were developed for the measurement of γ∞. 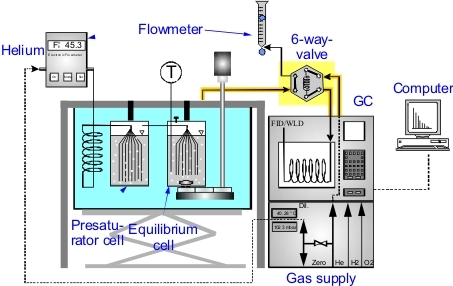 The most important methods are: gas-liquid chromatography (GLC), non-steady-state gas-liquid chromatography, differential ebulliometry, static methods and the dilutor method. Chromatographic methods allow the determination of γ∞ of volatile solutes in high (classical GLC) and low boiling (non-steady-state GLC) solvents. The dilutor method permits the determination of γ∞ in solvent mixtures. The addition of water to selective solvents (e.g. NMP + water) often increases the selectivity of the solvents used. The activity coefficients at infinite dilution can be measured with the help of the dilutor technique (inert gas stripping). A scheme of the experimental setup is shown in the following figure. In this device, a highly diluted component (solute) is stripped from a liquid solution (solvent) with a constant inert gas flow (helium). 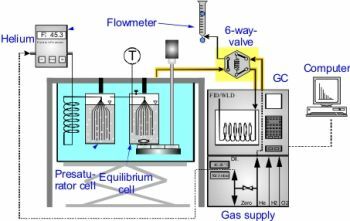 The variation of the solute concentration in the gaseous phase is measured by gas chromatography, i.e. samples are taken and analyzed in regular intervals (6-port-valve). From the obtained diagrams (ln (peak area) vs. time) the activity coefficients at infinite dilution can be determined. For solvents and particular solvent mixtures of appreciable volatility it is necessary to use a saturator cell. The stripping gas is saturated with the solvent vapor in order to keep the amount of solvent in the equilibrium cell constant. The saturator also provides a steady solvent composition if mixed solvents are used.